So You Want to Be a Category Management Expert? What Will I Learn as an e learning Category Management Ninja? Know how to identify a Category target that is simple, easy to understand & explain, and how to write the Category target in a S.M.A.R.T. way. Be able to bring your Shopper to life, showing the opportunities, their barriers, their motivations, and their needs. Understand how to turn data into insights, and then into opportunities. Be able to sell more of your opportunities to the Supermarket. Know how to increase your chances of landing your opportunities in-store. Understand how to measure your performance as a Category Manager and to continuously improve. If you have received your certificate and you do not identify, sell, & land over £10,000 of opportunity within 6 months we will refund you. No questions asked. Thank you for your interest in this e learning Category Management training course with MBM. The cost is £249.00+vat. This 7-week course has been designed using over 150 years of Retail Category Management experience, by ex-Nams, ex-Category Managers and ex-Buyers. Each week we will email you a piece of the course to study and then complete. This online Category Management training course is, however, not for the faint-hearted. You must start each piece of coursework, and where possible, complete it in that week. If you get behind, you may struggle to catch-up. It is essential to define Category targets from the outset. Without targets, you will have no idea where you are going, and you cannot develop a category strategy. However, we have found many Category Managers to have failed to agree on a specific target for the Category. Many Category Managers fail to understand two-thirds of the ‘shopper’. We encourage you to focus on the ‘whole shopper’; baring in mind that the in-store customer may not be the ‘preparer’ or ‘eater’. How aligned is your Category Management process to the goals and needs of your Supermarket? 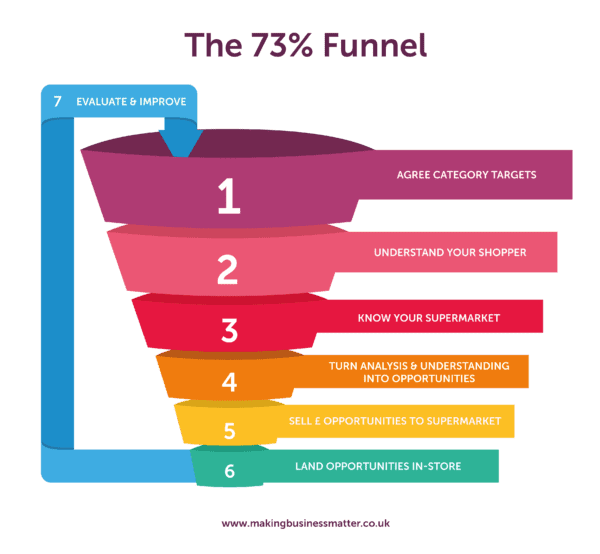 Developing knowledge and awareness of the supermarket’s current strategies will help you develop category tactics that fit. Are you lost in a sea of Category data? Unsure how to gain deep insight and find Category sales opportunities? We help you match the best sources of data with the correct analytical tools and skills. You’ve put in the hard work to find and understand the opportunity. However, we know that only 27% of opportunities will ever make it in-store. The toughest part is often selling the opportunity. We show you alternative ways to engage the buyer and help build your selling toolkit. Store operations are often forgotten or ignored. We help you make sure that your recommendations to your Buyer don’t just look good on paper as a retail planogram, but that they also will land well in-store. This ensures you don’t waste all of your hard work creating your category plan at the final hurdle. It is essential to understand how to measure your performance as a Category Manager and to continuously improve. 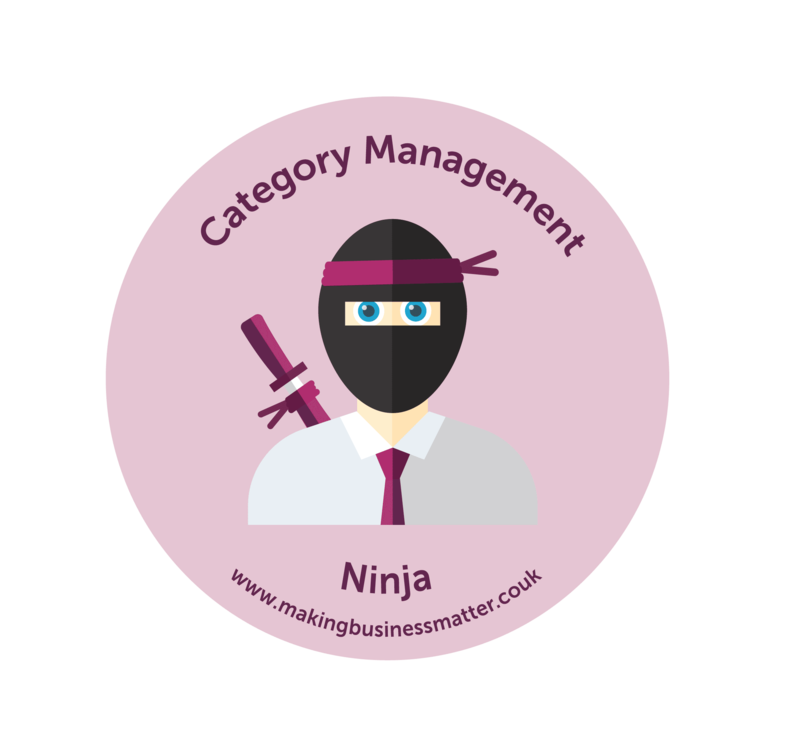 That way you can beat the industry average and become a Category Ninja! Who Is This Training Course Ideal For? In short, Category Managers. You might be a titled ‘Category Manager‘, or an Account Manager that knows one of the key responsibilities is to manage the Category. In addition, the course is useful for NPD Managers, Marketing Managers, and Supply Chain Managers. Furthermore, Sales Directors and Marketing Directors will also benefit from this training course. This e learning training course is ideal for Suppliers to UK Supermarkets. That said, Supermarket Buyers would find this useful as well – If only to give better direction to their Suppliers. You might have worked in categories for +10 years, or be just starting out. This training course is suitable for all levels of experience. Junior Category Managers might find the course a stretch at first. However, the course will help you to understand what you don’t know. That, in turn, will help you to move along the 4 levels of the hierarchy of competence. From unconscious incompetence (I don’t know what I don’t know) to conscious incompetence (I know what I don’t know). Experienced Category Managers are often stuck in routines. For instance, you might be stuck on the PowerPoint treadmill. This training will help you to re-focus and to learn some advanced Category Management techniques. 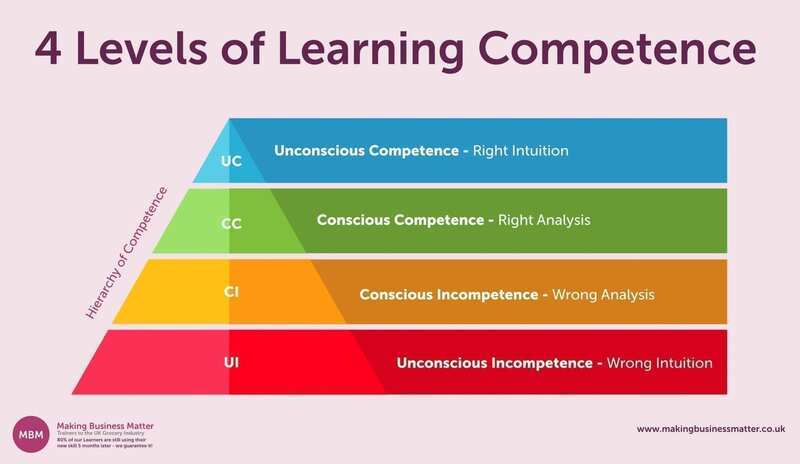 Furthermore, it will help you to see whether you truly are operating at the Unconscious Competence (UC) level. For further information, take a look at our Ultimate Guide to Category Management and our Category Management Tips YouTube Channel. Or, see how our other Category Management Courses can be of help to you.